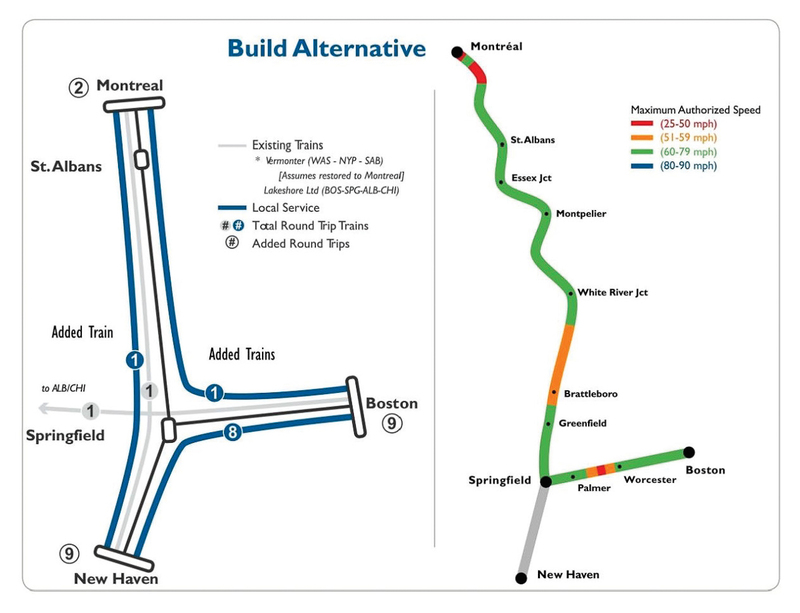 In 2017 the Federal Railroad Administration (FRA), Massachusetts Department of Transportation, and the Vermont Agency of Transportation, in coordination with the Connecticut Department of Transportation completed a two-year feasibility and planning study known as the Northern New England Intercity Rail Initiative (aka the NNEIRI /nɪri:/ Study). 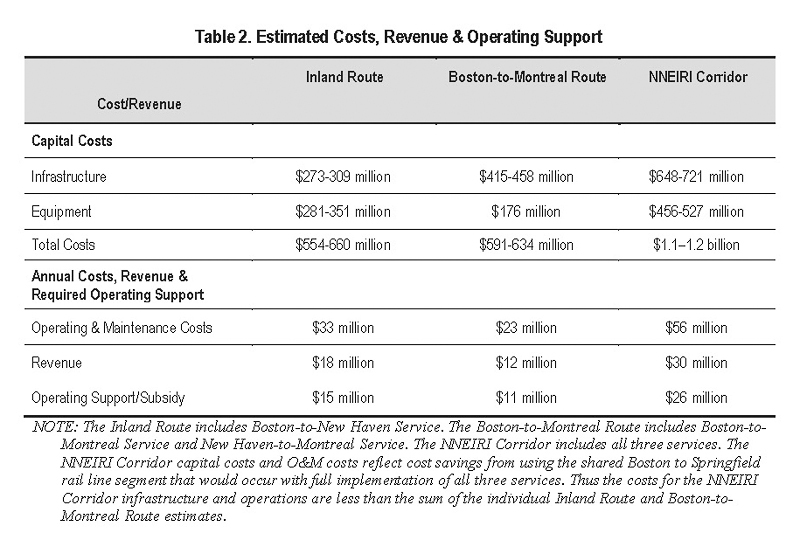 The NNEIRI Study examined the opportunities and impacts of adding more frequent and higher speed intercity passenger rail service on two major rail routes — the Inland Route and the Boston-to-Montreal Route. The Inland Route runs between Boston, Mass. and New Haven, Ct. via Springfield, Mass. 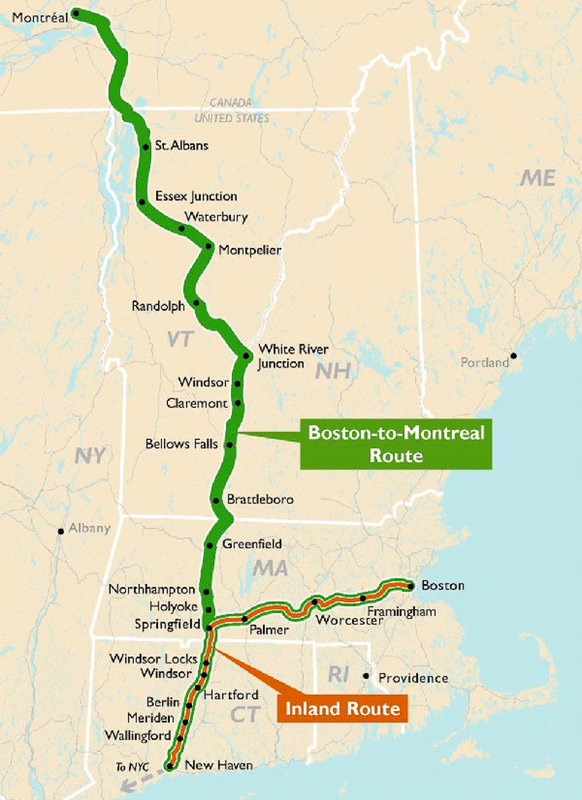 The Boston-to-Montreal Route runs between Boston and Montreal, Que. via Springfield. The two routes share trackage between Boston and Springfield. One (1) new daily round trip between New Haven and Montreal. The Build Alternative proposed in the study projects a total annual ridership of 875,000 passengers. The capital costs to implement the services of the Preferred Alternative — which includes the purchase of new train sets and infrastructure improvements — would be between $1.1 and $1.2 billion (in 2014 dollars), as detailed in the following chart. On July 19, 2016 the Federal Railroad Administration (FRA) announced a Finding of No Significant Impact on the Northern New England Intercity Rail Initiative. The FRA found that no significant environmental impacts would result from adding more frequent and higher speed intercity passenger rail service, in large part due to the use of existing operating rail lines within existing rights-of-way.